Haryana Staff Selection Commission (HSSC) is going to conduct written test for the posts of Post Graduate Teacher (PGT). The written exam is scheduled to be held on 23, 24 and 25 May 2016. 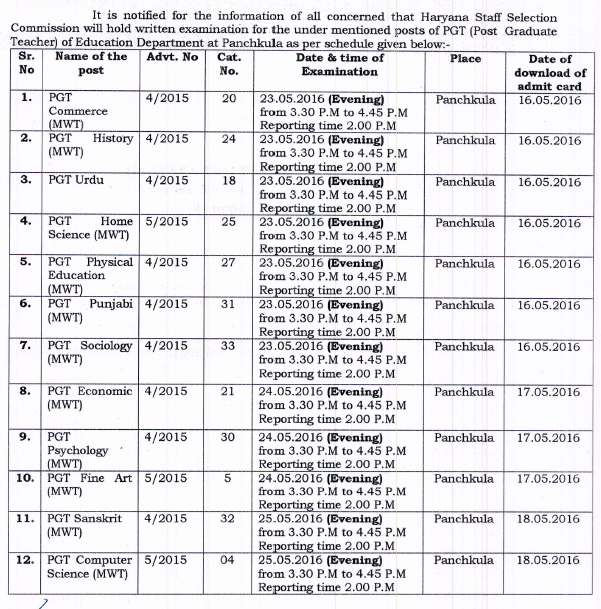 Earlier Haryana Staff Selection Commission had completed the process of getting applications for advt 4/2015 and 05/2015. For appearing in this test, aspirants have to download the admit card from below. The Admit card of HSSC PGT will be released around 7 days before the exam. Those candidates who had applied, can download HSSC PGT Exam Admit card from here. HSSC is going to conduct written exam on 23, 24 and 25 May 2016 for PGT posts. For that, admit card are going to be released as per the dates given here. Candidates have to download Haryana PGT admit cards from the official website hssc.gov.in via the direct link given below. The test will be held at various centres in Haryana. Current Status: to be released 7 days before the exam dates mentioned above. The written examination consists of 80 multiple choice objective type questions. Questions are divided in two portions. 1. 75% weightage will be given to General Awareness, Reasoning, Math, Science, English, Hindi etc. 2. 25% weighage will be given to History, Current Affairs, Literature, Geography, Civics, Environment, Culture etc. of Haryana.